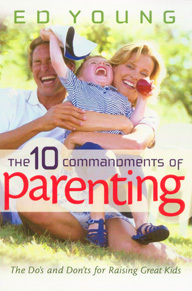 To raise Children, you can make it a little easier- and a lot more rewarding-simply by following The 10 Commandments of Parenting. If you're feeling overwhelmed by it and, if your kids are headed in the wrong direction, or you just need a refresher of what matters most, this could be the turning point you've been praying for. And if you're a brand new parent, you'll thank God for an opportunity to build your child's character on solid ground.